The movie will be released on 2/10/15 and includes the preorder price guarantee, so if the price drops before the release date, you'll pay the lowest price. Remember, if you find a better deal closer to the release date, you can always cancel your Amazon order since you're not charged until your order ships. 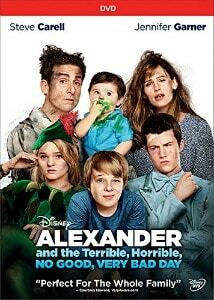 Disney's heartwarming comedy will have your entire family laughing out loud. Based on the best-selling book, it follows the exploits of Alexander as he experiences the most terrible and horrible day of his young life and wonders if bad things only happen to him. But he discovers he's not alone when his dad (Steve Carrell), mom (Jennifer Garner) and family live through their own terrible — and hilarious — day. It will tickle everyone's funny bone and warm their hearts as they discover how even on rotten days, families can grow closer.